The Swedish P&I Club has published its Monthly Safety for November 2015 regarding an incident due to defective main engine lubricating oil. The Swedish Club publishes on a monthly basis a new “Monthly Safety Scenario” (MSS) to assist owners in their efforts of complying with the maritime regulations. The vessel had completed a scheduled drydocking. After departing from the dry dock the vessel experienced extensive water leakage at various locations, which led to excessive water on the tank top. The leaks were repaired and completed the following day. The following day an unusual noise could be heard from cylinder unit 4. The main engine was stopped and the crankcase opened. An inspection of the unit revealed problems that could not be rectified immediately. 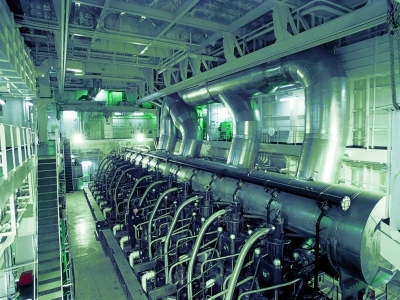 Cylinder unit 4 was isolated. Furthermore the crew found the system oil was contaminated with 2% water. Without any rectification the main engine was restarted and the voyage resumed. Shortly afterwards a loud noise was heard from the main engine and the exhaust gas temperature of cylinder unit 8 was slowly falling, so it was decided to stop the main engine for further investigation.The crew changed several fuel injection valves and fuel pumps. After several starting attempts the engine was finally restarted. 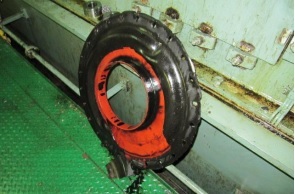 During an inspection in the destination port, by the main engine manufacturer, it was discovered that there was extensive damage to the main bearings, big-end bearings, cross-head bearings, piston rods, piston crowns and exhaust valves. All these parts had to be replaced and the vessel was out of service for three weeks. An investigation by the manufacturer’s engineers found that two of the three rubber diaphragms on the crank case oil outlets were defective. Water from the tank top had entered the main engine sump tank via these defective diaphragms and thus contaminated the lubrication oil. The damage to the main engine was extensive and expensive. The repair cost for this type of engine damage can easily reach millions of dollars. Inspect the diaphragm sealing for the crankcase oil outlet every 32,000 hours of operation. Always replacing the diaphragms during inspection. The cost of an inspection/replacement is minimal compared to the consequences if left unattended. A water content higher than 1% could lead to critical damage within a few days of operation. If the oil system is contaminated by an amount of water exceeding the limit of 0.2%, the manufacturer should be contacted.